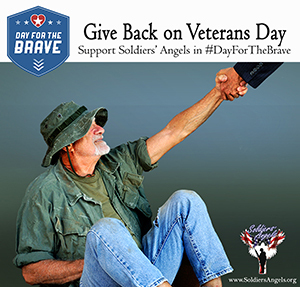 Veterans Day is November 11th and Soldiers’ Angels is participating in a great campaign to honor Veterans and raise money for our ongoing causes. The campaign is called Day for the Brave. It is a 24-hour online giving event that will bring together nonprofits and individuals around the country to give back in support of our nation’s veterans. Your donation will help us continue our mission that No Soldier Goes Unloved by providing support to deployed troops as well as veterans in VA Hospitals across America.